Welcome to Aberdeen Plastics. For over 20 years from our warehouse in Brooklyn, we have manufactured our collection of classic high-end storage drawers and closet organizers and distributed them to businesses throughout the world. Our unique, crystal-clear boxes fit into all custom closet systems. Our philosophy is based on balancing beauty with practicality and form with function. As a result, our pieces have a timeless feel and are designed with the goal of making your life a little easier. To further maximize organization and reduce everyday clutter, divide each box into compartments with our dividers and tops. Give everything its proper home. 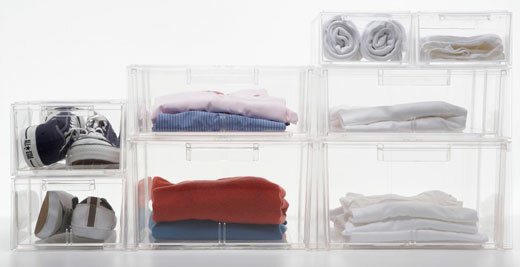 The drawers provide protection for your favorite sweater, shoes or jewelry. Think outside the box and you will find space for scarves, socks, arts and crafts, office supplies, toys, toiletries and more.